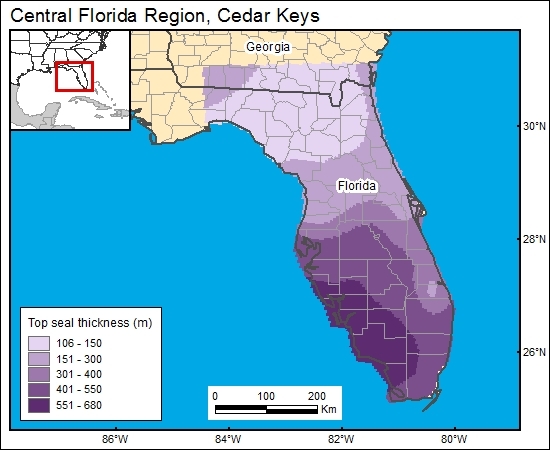 The top seal for the lower Cedar Keys and Lawson Dolomites is the middle Cedar Keys Formation. This unit is composed of massively bedded anhydrite, and it is the lower confining unit for the Floridan aquifer in southern Florida (Miller, 1986). A lithologic well log from Mulberry, Polk County, Florida, reports that this anhydrite-rich unit is 670 ft thick. Cross sections by Miller (1986), which span southern Florida, indicate that this confining unit is as much as 1,000 ft thick. We use GIS technology to combine the Cedar Keys Formation thickness and percent-anhydrite maps of Chen (1965) to derive an anhydrite-thickness map for the Cedar Keys. Winston (1994) also presented evaporite isolith maps of the middle Cedar Keys interval. We think that these anhydrites, which are more than 800 ft thick in places, would make a very effective top seal for sequestration of CO2. Winston, G. O., 1994, The Paleogene of Florida, v. 3. Lithostratigraphy of the Cedar Keys Formation of the Paleocene and Upper Cretaceous age—Peninsular Florida and environs: Miami Geological Survey, 52 p.